"Misery" is a joint Lennon-McCartney composition originally written for sixteen-year-old Helen Shapiro when she toured the UK with the Beatles in February and March of 1963. The cool Beatles fact is that although Shapiro was the most popular pop singer in Great Britain at the time, her management declined the song. It was recorded on February 11, 1963 at Abbey Road and was included on the Please Please Me album, the group's first. McCartney and Lennon share lead vocals. 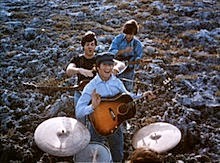 Lennon plays rhythm guitar, Harrison lead, McCartney bass, and Starr drums.